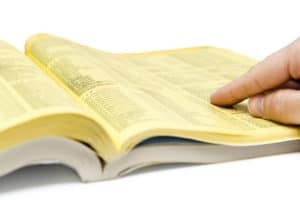 In this post we’ll be discussing why you should carefully consider all of your options before choosing Yellow Pages as your internet marketing partner. They are notorious for a one-size-fits-all approach, jargon-laden meetings and little personal concern for their clients. Your competitors use Yellow Pages too. Money can’t buy you a better return on investment. Yellow Pages is of the mentality that what they provide for one business can be applied in the exact same way for every other business they represent. This is a classic “shotgun approach” to internet marketing, and a horrible solution for any business looking to truly succeed online. Sure, eventually you’re going to land a client or two by shear volume, but the quality of most of the leads they deliver you will be very low and unlikely to convert. Instead, having an intimate understanding of who your true clients are and adapting to the way they search for your services online is the only true way to see success. This process takes time and effort, but in the end you’ll end up saving time and money. Now, please don’t assume that just because your competitors employ Yellow Pages that they’re onto something good … it’s really just a matter of the shear number of salespersons and automated phone calls that have ultimately worn them down into submission. Maybe that’s a little harsh, but it’s also not a departure from the truth. The point is that Yellow Pages promises you “unique business opportunities” that aren’t actually unique at all. You’ll only be thrown in the mix with all the rest of your competitors (regardless of reputation), except for the ones that pay more than you. Yellow Pages is a huge company that suddenly found themselves irrelevant do to the lack of interest in their book, so they threw a ton of money at their marketing department to try and establish an online presence themselves … but not very well and at the expense of their clients! One of the most important (of many) keys to a successful internet marketing strategy is to stand out from your competition by offering unique and useful content. This content should be relevant, accurate and fresh. Yellow Pages is notorious for using arbitrary numbers and scare tactics to persuade you into thinking that their efforts are actually valuable to your business. Instead of identifying ways to reduce your spend and increase their effectiveness, they’ll request that you spend more money if something isn’t working quite right. This is a recipe for disaster. Red flag! This actually illustrates exactly what they try to do: spend more of your money to outbid your competition. Will you show up “first” within the paid ads space? Yes. But the cost of those clicks will cripple your budget for the rest of your campaign. Instead of trying to confuse you with jargon, your internet marketing partner should be fully transparent and willing to explain how your money is being used effectively. The bottom line is this: if don’t mind handing your online reputation over to an entity that absolutely does not have your best interest at heart, that’s your choice to make. They will happily take your money and do very little with it … after all, they are serving hundreds of thousands of other business across the continent, so they must have a “personal digital advisor” for each and every one, right? Not possible. Please exercise great caution before signing any agreement with Yellow Pages. You owe it yourself to spend a little more time researching the best solution that meets your online needs.